Female: Welcome to The Greg Amundson Show. This is a podcast where Greg will educate and inspire you to live with purpose, passion, and a burning desire to develop strength in your mind, body, and spirit. Through a disciplined use of our words, thoughts, awareness, and attention we can achieve a mindset of positive expectancy, personal belief, and an unshakable faith in God. Greg: Hello, friends. Welcome to Episode 14 of The Greg Amundson Show. I am so excited about the show. Now, I know that is how I normally introduce The Greg Amundson Show by saying — I am so excited — but I really am excited about this particular show because we are going, in just a few moments, to Tacoma Washington. We are dropping in on a lecture that I gave at the 2017 Triggercon conference which is a renowned weapons industry conference that focuses on innovation in that field. What’s extremely special to me about this lecture is that seated in the lecture hall while I’m speaking are some heroes of mine, some people that I consider mentors, people that I now consider dear friends. The theme when these people and I reflect over the weekend is, without a doubt, we are in agreement. Our meeting at the specific time and place that we all met this past weekend in Tacoma was a divine intervention. God’s hand was in our hand. He brought us together this weekend. Seated before me while I’m speaking was a gentleman who I have spoken about at great length on the show, Joshua Mantz. By way of introducing Joshua Mantz — check this out — Joshua Mantz was shot and killed by an enemy sniper in Iraq. Yes, my friend, you heard me correctly. Joshua Mantz was shot and killed by an enemy sniper in Iraq. And he was seated very much alive during this lecture. Joshua Mantz is the author of a book which will be available in just a few months — I’ll be the first to say, it’s a New York Times bestseller — called Beauty of a Darker Soul, a renowned speaker, amazing leader, a great man, someone I consider a dear friend. Also seated in the lecture hall this day — my gosh, this is still hard for me to even fathom because this is someone that I have held in legendary status, and I still do, I consider him a friend now but he’s my legendary friend — and that is Jay Dobyns, author of two books, one which I read when I was a young agent with DEA called No Angel, his newest book called Catching Hell. When I was a young agent with DEA going through undercover school our undercover instructor says, “Hey, all you agents, you want to know what real undercover work is like, read the book No Angel.” I read that book. I could not put this book down. It is absolutely incredible. The life and the work, the service that Jay Dobyns has provided to our country, the inspiration he’s provided to me and thousands of other agents and officers who work undercover is incredible, incredible. What was so special about meeting Jay is that I led Jay through his very first CrossFit workout. Special thanks to Tacoma Strength and Conditioning for opening their doors to us. Jay’s first CrossFit workout was the exact same first CrossFit workout that Coach Glassman gave me in December 2001. I thought that will be very fitting for a legend. The other person seated before me during this lecture that we are going to attend in just a few moments is Kevin Briggs. Kevin Briggs is a retired CHP sergeant who was stationed for the majority of his career on the Golden Gate Bridge. This man is of a legendary proportion in mental crisis intervention, suicide intervention. He has saved countless lives. He is the author of the amazing book Guardian of the Golden Gate Bridge, a great man, someone I consider a dear friend. Then Jason Redman, United States Navy SEAL, author of a book that’s just awesome called The Trident. Jason teaches a very, very powerful mindset called I overcome. A very special moment took place with Jason and I. Jason and I and Jay Dobyns were seated all side by side signing books at this conference. And a young boy — maybe seven, eight years old — comes up the book signing line to speak with Jason Redman, and says to Jason, “I want to be a Navy SEAL.” And in that moment I was able to capture a photograph of the conversation that then took place where Jason taught this young man the I overcome mindset. I tell you what, Jay Dobyns and I agree that young man is forever changed in a profoundly, positive way. If you get an opportunity, that photograph is on my Instagram, Facebook and website. It shows the photograph of the young boy’s face in that moment when Jason Redman is providing him with the inspiration and encouragement that he will need as he continues through life. The other person seated before me is a woman named Karen Vaughn. She’s the author of a book I highly recommend and endorse called World Changer. Tragically, her son was killed, United States Navy SEAL who lost his life in Afghanistan. And her book is one of the most inspiring books that I’ve read because it inspires me to develop an even deeper and more intimate relationship with God. Then, last but certainly not least, is the man who was responsible for this gathering of authors and speakers. He is the founder, the inspiration behind what is known as the Patriot Authors Network soon to also include the Patriot Authors Speaking Bureau, I’ve mentioned his name before, Robert Vera, the author of an awesome book called A Warrior’s Faith. So there I am trying to get my wits about me to give a lecture in front of people who I consider to be some of the greatest Americans, the greatest warriors, the greatest leaders, and some of my greatest friends. Needless to say, I was a little bit nervous. Good thing, however, that I’ve been trained by Mark Divine on how to feed the dog of courage which is what we all learned about in this lecture. And so, my friends, without further ado, in the words of CrossFit founder, Coach Greg Glassman, three, two, one, let’s go to Tacoma. What a blessing. I’m thrilled to be here. Special thank you to Robert for having me among these other amazing speakers and authors. My friends, by way of introduction, let me take you back in time. Many years ago one of my dear friends, a mentor of mine, said these words to me, he said, “Greg, if you tell me the truth, I will believe you. If you tell me a fact, I will listen. However, when you share with me a story, then I will remember.” My goal today, of course, is for you to remember the lessons that I share with you and that the other amazing authors and speakers share with you. And that, my friends, is through the context of sharing stories. This young man and the village elder leave the safety and the comfort of the village, and they go deep into the woods, and they hiked for hours and hours through the woods. And suddenly, they come across a beautiful stream. There, gathered around the stream, are people who are prospecting for gold. The old man says, “Look at these people who are here prospecting today. There are three distinct types of people. One of these prospectors will put their pan in the water, and immediately they will strike gold, and they’ll leave, and they will live happily ever. There are some types of prospectors that are here, and they’ve been here day in and day out for months now, and they keep coming back. They have perseverance. They keep coming back because they know there’s gold in the water. They’ve seen other people strike gold so they know, any given day now, they too are going to strike it rich. Life purpose, my friends, has been something that, to this day, I am so passionate about in my own life and in inspiring other people to realize that each one of us in this room right here, right now was born with a unique life purpose. In the warrior tradition we refer to this as a mission. There was a mission that God gave you that only you can fulfill during your lifetime. And it gets better because in order to fulfill this mission that you’ve been given, God also gave you unique talents, special abilities, skills, unique ways of expressing these abilities, talents and skills. In fact there’s something that you can do better than anybody else in the entire world. Isn’t that amazing? What a blessing. And here’s what’s exciting, here’s what I want you to understand. When you start to step onto that path of achievement of life purpose, there will be two voices in your head. One voice in your head is saying, “I was born for this. I can do it.” Another voice in your head is saying, “No, you can’t.” And that balance between I can do it, no, I can’t, that is the path of the warrior. When we look to the historical stories of the warrior tradition, when we look to some of the greatest leaders of all time, we find the same battle taking place. Essentially it’s the classic, timeless battle of good versus evil. We can look to the holy Bible. 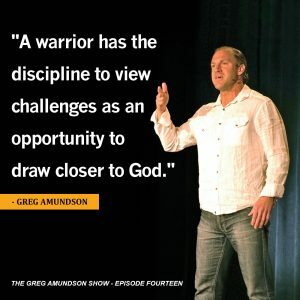 We can look right to the life of Jesus Christ, the greatest warrior leader who ever lived. Greg: When Jesus was in the temple preaching publicly for the first time, He read from the scroll of Isaiah. He essentially, in that moment, declared to everyone there the purpose of his life. He said, “Behold. The spirit of the Lord is upon me.” And then he laid out the purpose of his life. And no shortly after he proclaimed the purpose of his life, then someone in the audience said, “Hey, aren’t you Joseph’s son?” meaning, “You’re just a carpenter. You didn’t come to save the world. You can’t do what you just professed you would do. You’re a carpenter. Who do you think you are to make that statement of life purpose?” And so you see, even Jesus Christ was faced with the same battle between good and evil. For years, I’ve worked as a special agent with the DEA, the Drug Enforcement Administration. I know there are many other law enforcement officers including my brother Jay Dobyns in the back, but I personally think DEA is the premier law enforcement department in the country, if not, the world. CHP sergeant, he’s like, “What?” Jay Dobyns, “What?” DEA is an amazing organization. I really wholeheartedly believed in their mission. I was stationed right out of the Academy on the Southwest border. And at the time I was stationed there, it was a battle, it was a war zone. That’s where, as a young DEA agent, you wanted to be. Drugs were essentially falling out of the sky. The place to be as a young agent. I found myself challenged because here I was trying to hunt down and capture the greatest drug cartels in the world, yet, what about the kids on the Southwest border who, without direction and leadership, would essentially grow up to be the next cartel leader. So I asked permission to speak to the kids in school and to try to educate and inspire them to pursue a path other than the violence and the gangs and the drugs that was so prevalent along the border. Now, if you know me, you know I’m a bit of an optimist. So I thought to myself, “Well, maybe his dad is a rocket scientist. Maybe his dad’s an astronaut.” It does beg the question though, what does your dad do. So I asked him. And he looked at me and matter-of-factly said, “My daddy’s in prison for dealing drugs.” And he told me, “I’m going to grow up and be just like him.” It devastated me. It made my entire career, up to that point, in law enforcement seemed fruitless. And I realized, in that moment, two critical insights that I want to share with you. The first is that as we go through the course of our day, we just never know if that one little word of hope, that one little word of encouragement, that one little word of you can do it, we never know if that will be the first time that person has heard that word of hope and encouragement and love and support that day, that week, that month, that year or, maybe like that little boy, that lifetime. That little boy had never heard from his father, “Son, you can do it. Son, I believe in you. Son, you were made for great things. Son, you were born with a purpose in life.” He never heard that, and I heard that from my dad every night before I went to bed. So that was insight number one. We never know when we will be the voice of God encouraging someone on the purpose of their life because imagine if that young boy’s purpose in life was to be a law enforcement officer, and his own father was telling him, “No, it’s not. You can’t do it son. In fact, you’re going to do the opposite.” In that case, it’s going to be up to you and I to be that voice of encouragement in that person’s life. And number two, sometimes that voice of encouragement, my friends, do you realize where it ultimately needs to come from? Exactly. Sometimes the voice of encouragement we need to hear the most is going to take place right here, in the temple of our mind. This is what my friend, Jay, would refer to as the overcome mindset, the I can do it mindset, the I believe in myself mindset, the overcome, I got this, hooyah, mindset. Sometimes that voice needs to come from within. How do we cultivate that voice, how do we listen to that voice, how do we discern that voice, that is the path of the warrior. The good news is that there are some tools, there some specific strategies we can utilize to harness, to hear, and to speak that voice for ourselves and for other people. In 2010, while still an agent with the DEA, I went through an amazing 50-hour full immersion course called kokoro. Kokoro means the merging of heart and mind. It’s a term that comes from the samurai tradition, a tradition I’ve been fascinated by from a very young age. The samurai believed on the path of a warrior. In order to cultivate that spirit, the heart and mind had to be merged into one. Kokoro was created by a gentleman named Mark Divine, 20-year Navy SEAL, an amazing martial artist, New York Times best-selling author, incredible leader. He designed this course. It was designed to mimic the first 50 hours of the true Navy SEAL hell week. Needless to say, the whole point of this course was to challenge you to the core. I volunteered to go through this not really knowing what I was getting myself into. I was standing in Encinitas just outside San Diego on what’s called the Grinder where this course was going to launch from, standing in a typical platoon style formation, green camo pants, white T-shirt, my name across the chest. I’m standing there that day with some of my friends whom I knew, most people I did not know. Most of the people were in the Navy with a goal of going through and successfully completing BUD/S. They’ve been training with Mark Divine for months in preparation for that course. Mark Divine stands in front of us. Let me paint the picture. Mark Divine is about ‘6″3, huge, strong, muscular guy, yet, because of his martial arts training, moves with the grace of a ballerina. Beautiful to watch in action. He just glides in front of us. Well, what Mark taught me was absolutely profound, and I’m thrilled to share this with all of you. What Mark taught me is that in the warrior tradition it was believed that each and every one of us has within us two dogs. In the Native American warrior tradition it was referred to as two wolves. These dogs that are inside of us are starving for your attention, yet, what they’re starving for specifically in terms of your attention is quite different. One of these dogs is starving for courage, the dog of courage. The other dog is starving for fear, the dog of fear. Good and evil, light and darkness, positive-negative. The good news, my friends, is that whichever dog grows strongest in our life, in our mind is up to us. We ultimately get to decide which dog we are feeding. The primary fuel source, the primary nutrition, the primary food these dogs both want is your thoughts and your words and your actions. Notice, however, that I introduced it in that specific order; thoughts, words, actions. In that moment, I was standing at attention, and I started to lean in as close to this man as I could because I knew in that moment God brought him into my life. I needed to be tempered and forged, and this was someone that was going to help me do it. What’s abundantly profound about what this senior staff sergeant in the US Army said, those words, my friend, are in fact a quotation from none other than Gandhi. Profound. Your thoughts will become your words. Your words will become your actions. What determines the thoughts we entertain? Our ability as warriors to feed the dog of courage. Right now, whether you realize it or not, you have with you the greatest asset you can begin to imagine that can help you in feeding and cultivating that dog of courage. You’ve had this tool, this skill, this gift with you since the day you were born, however, you may not be aware of its power in your life. Let me ask you a question that was proposed to me by a gentleman named Col. Dave Grossman. Col. Dave Grossman was a career US Army Ranger, New York Times best-selling author, an incredible warrior leader. He asked me this question when I was an agent with the DEA. He said. “Do you know how to breathe?” And there I was thinking to myself, “Who does this guy think he is asking me if I know how to breathe? Does he know that I do CrossFit? Does he have any idea who I am?” The ego reared up its ugly head. And I, sadly, did not pay attention to the question he asked me. Do you know how to breathe? Not are you breathing. Do you know how to breathe? Thankfully, when I was a candidate going through kokoro with Mark Divine, he proposed the same question to me. Do you know how to breathe? And in that moment, God was giving me another opportunity to learn a profound lesson because, you see, in the universe when you’re proposed the same question multiple times, we call that in law enforcement a clue. I had to get a clue that I did not know the first thing about breathing. Mark taught me — what’s incredible — the same breathing technique that Col. Dave Grossman taught me. Two great warrior leaders teaching me the same breathing skill. I’ve done this breathing technique every day since. I challenge you, I encourage you to utilize this breathing technique in your life as well because this breathing technique is the merging point, it’s the bridge that yokes or unites, as we say in yoga, the mind, the body and the spirit. What we are going to do is create in the mind stillness, stillness. Imagine this, imagine if your mind was like the ocean, big waves rolling through the ocean. And we went into the middle of the ocean on a stormy day, and we took a great big rock, and we dropped that rock right into the ocean. Would we even see the indentation or moment of impact the rock made with the mighty waves? It would make no difference at all. Now imagine same rock, same boat but we’re on a lake, the lake is perfectly still, and we dropped that rock. Will we see and notice the rippling effect the rock has? Absolutely. In fact, we can probably drop a pebble, a single stone into that river, and we would see the effect. Gandhi said a single stone can change the course of an entire river. Metaphorically that’s what happens in our mind once our mind is still. Once we still the mind, then we can very attentively discern, “Ah, yes, that is the dog of courage,” yet, we need stillness first, and that is what we are going to cultivate. Take a moment to sit up nice and straight in your chair, feet planted firmly on the ground. Press your back into your back rest and roll the shoulders back. And notice, when you roll the shoulders back, that automatically draws a breath in. Just the posture of the body invites the breath. Now imagine that on the crown of your head is a little string. And I take that string and tie it to the ceiling and then tighten up that string. So the spine just naturally lengthens. Nice. Now close your eyes. Just notice how when we sit physically still and close the eyes, physical stillness of the body lends itself to physical stillness in the mind. In the Bible it says be still and know. Now just begin to bring awareness to your breath. Just notice the fact that you’re breathing. Feel the breath come into the body. Notice the subtle changes in the body as you breathe in. Notice the shoulders naturally rise. Notice the abdomen fill. Really enjoy the breath, savor the breath. The breath of life is falling into you right now. Now, for this breathing technique I’ll teach you, we’re going to utilize the nostrils for both the inhalation and the exhalation. So let’s begin by letting all the air out. Gentle exhale. Nice. Now inhale through the nose. Two, three, four. Hold the breath. Two, three, four. Exhale through the nose. Two, three, four. Hold. Two, three, four. Inhale. Two, three, four. Hold. Two, three, four. Exhale. Two, three, four. Hold. Two, three, four. Inhale. Hold. Exhale. Hold. One more round. Deep breath in. Hold. Exhale. Slow breath out. Beautiful. Keep the eyes closed. Continue the breath on your own. Natural respiratory cycle. Just notice the stillness in the entire room. Notice the stillness in your body. Notice the stillness in your mind. The sand has settled. The water has become clear. That lake in the mind is perfectly still. Now, find that perfect mantra that speaks to your spirit. Mantra, affirmation, prayer, Bible verse, perhaps even a singular word, faith, courage, overcome, love. Perhaps it’s a mantra. I can do it. I overcome. I press forward. Perhaps it’s a Bible verse. I can do all things in Christ who strengthens me. Greater is my God who is in me than He it is that is in the world. Find that perfect mantra, that perfect affirmation. Begin to play it in your mind. Repeat it to yourself in your mind so clear so you can hear your voice in your mind. These repetitions of your mantra in the stillness of your mind are so powerful, my friends. Then just take one more deep breath in. Slowly open the eyes. Powerful practice. That is a profound way to start every single day of your life. Every single day of your life you have an opportunity to remove yourself from the temptations of the world, the distractions of the world, to turn your attention inward, practicing what’s known in yoga as pratyahara, turning the attention inward. We see this direction in the Bible. Behold. The kingdom of God is within you reversing the tendency to project through the senses onto the world. Every day, you can practice that sacred tradition of closing the eyes, becoming still, and connecting with your life purpose. In closing, my friends, I want to share with you one more story. This story comes from one of the most important figures in my life, my dad. Just before my dad died, he said something to me that changed my life. I was seated at his bedside, Dameron Hospital in Stockton, California. My does was battling with cancer. I sat there, and he opened his eyes. Up to that point in my life, I’ve been very focused on external pursuit. Part of that external pursuit was driven by pride. Everything I did was for pride. Pride in my team, pride in my department, pride in my profession. Pride was driving everything I was doing. And so, of course, the last few words I want to say to my dad are about pride. And I stand up, moved to his head, and I leaned over, and I whispered, “Dad, I’m going to make you proud of me.” He looks at me and blinks and smiles, and voice is a bit scratchy, he says, “Son, whatever you do, do it for love.” That changed my life. Maybe it can change your life too. As we step onto the path of the purpose of our life, I challenge you to simultaneously pursue your dreams, pursue your aspirations, pursue your goals, relentlessly wake up every day and go for it. Yet, simultaneously, I challenge you to do everything that you do, from this point forward, for love. Well, my friends, may God bless you and keep you safe. Thank you all so much. Thank you, Bob, for having me. Thank you. Well, my friends, I really hope you enjoyed that lecture as much as I enjoyed presenting it. What a special moment in my life to speak before people whom I consider to be dear friends, mentors, legends. Even though I know Jay Dobyns does not like it when I say that, to me, the guy will always be legendary, heroic status. Well, my friend, I just want to take a moment to pray with you. And if you recall, one of my favorite prayers was taught to me by one of my yoga teachers, Rolf Gates. Rolf Gates, before he found the path to yoga, was a United States Army Ranger, a true warrior, world-class wrestler, an amazing man, author of a book I highly recommend for those of you on the path of yoga. It is called Meditations from the Mat. The prayer that he taught me really resonates with my heart, and I want to include it on our episode today. My friends, I pray that you would be safe. I pray that you would be happy. I pray that you would be healthy. I pray that you would find your freedom, that you would discover your peace. And I pray that you would walk through the world with ease. My friends, until next time. I pray that God would watch over you, inspire you, provide you with a burning life purpose. And, my friends, I will speak to you again soon back here on our next episode together of The Greg Amundson Show. Take care. Female: Thank you for listening to the show. Please subscribe, rate and share this podcast. You can find more info at gregoryamundson.com. Take care and God bless.